Longleat near Warminster was one of the first stately homes to answer the country’s call to provide space for the nursing of war casualties. Longleat Relief Hospital opened its doors on 7 November 1914 to 31 battle-worn Belgian soldiers who had fought to defend West Flanders after the retreat of the British Expeditionary Force. It had 2,044 patients in total. There were four trained nurses at the hospital and the rest were VADs (administered by the British Red Cross and the Order of St John). The trained nurses had loose hanging veils. Sometimes the VAD nurses sewed crosses on their aprons. Three grown children of the Thynne family contributed to the war effort. Lady Emma Thynne worked as a Lathe Turner in a Munitions Factory in Kent. She preferred this to nursing. Lady Kathleen Thynne was secretary of Longleat Hospital for the duration of the war. She also went to work at the YMCA canteen in Abbeville, N.France, serving troops (Sep & Dec 1916). John Alexander Thynne, 9th Viscount of Weymouth gave his life at Vermelles, aged just 21. He would’ve been the 6th Marquess. He is buried at Vermelles. 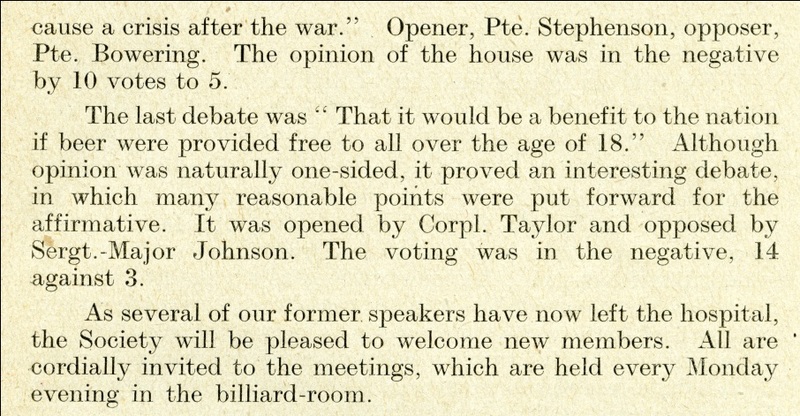 An extract about the Longleat Debating Society from the Longleat Lyre, october 1916. ← Is this the Mark V tank? Or the Mark V*?